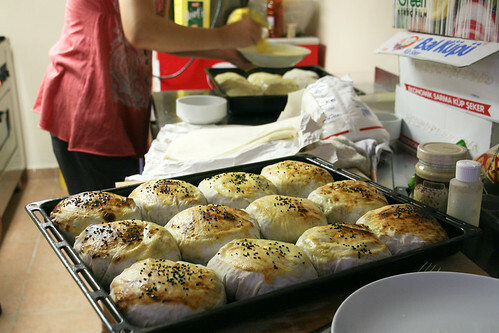 Before we even start to talk about Turkish food, we have to talk about how we learned about Turkish food. Volkan Inkaya has been the single most helpful hostel worker in the world, and you’ll almost always find him at the front desk of the Agora Guesthouse in the Sultanahmet district. Our first day we grilled him about local food — apparently we asked the right person. During our stay in Istanbul, he told us where to eat, then took us out to eat, and if that wasn’t enough, he actually cooked dinner for the whole hostel. 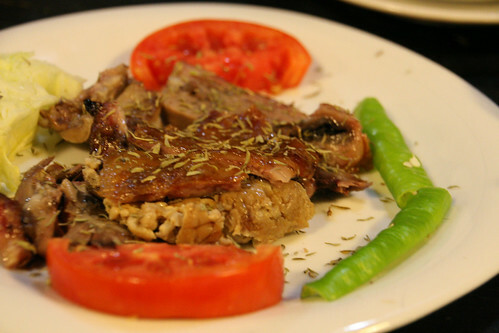 There are a lot of Turkish dishes that we were familiar with, without even knowing it. 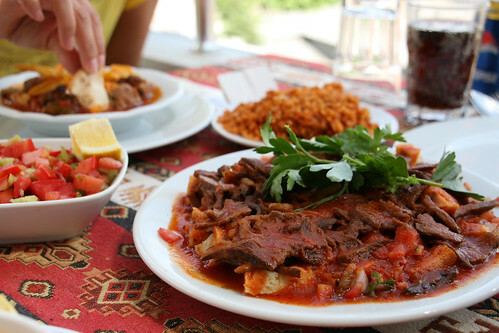 Wikipedia describes Turkish cuisine as a fusion of Central Asian, Middle Eastern and Balkan flavors. What we call a gyro at one restaurant is a döner in Turkey, and the simple salad mix of feta, tomato and cucumber is sacrosanct throughout most of the Mediterranean. Streets are lined with stands carving lamb from a distinctive vertical spit rotating before a wall of coal. 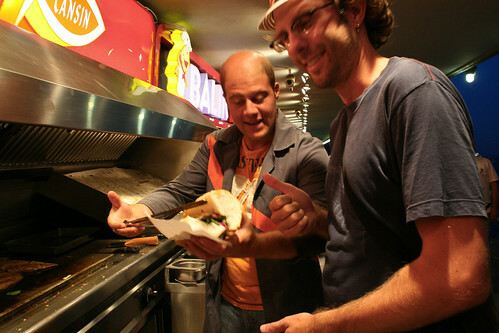 Many varieties of kebaps (kebabs for Americans) sizzle with peppers and garlic 24 hours a day. 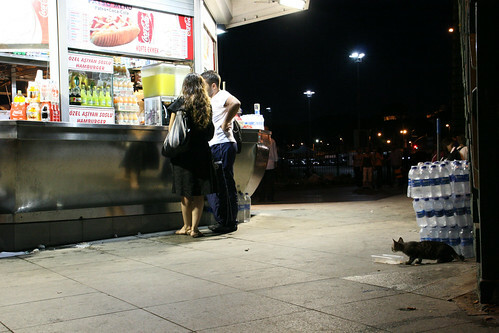 Basically, you can call this the local fast food. 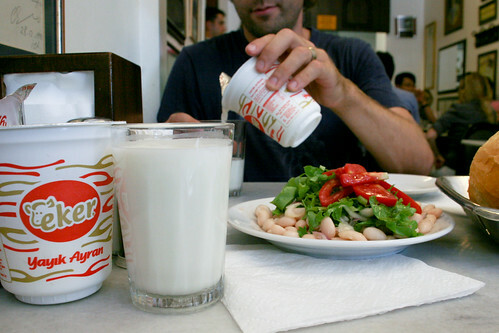 Wash it all down with a yogurt drink (Ayran in Turkey, Kefir in the Balkans, Ariani in Greece), and you’re set. Volkan encouraged us to try Doy Doy, a restaurant listed in our guidebook that he ordered from almost daily, and only a short walk from the hostel. Doy Doy’s plates are big, and easy to share. We ended up eating at Doy Doy for one reason or another three times during our week in Istanbul — aside from the great mixed grill plates offering a taste of everything, our favorites were the Adana kebab, Iskender kebab, eggplant kebab, Pide (Turkish flatbread pizza) and Talaş kebabı. 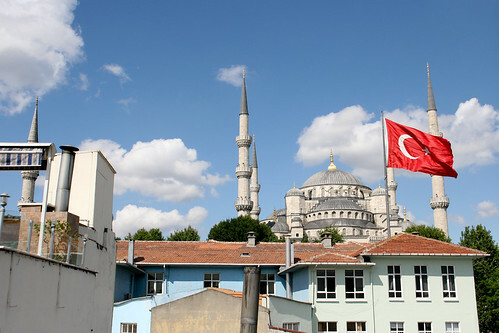 The view from the terrace onto the Blue Mosque is pure Istanbul. It took a day or two to find, but Manti is well worth the effort. 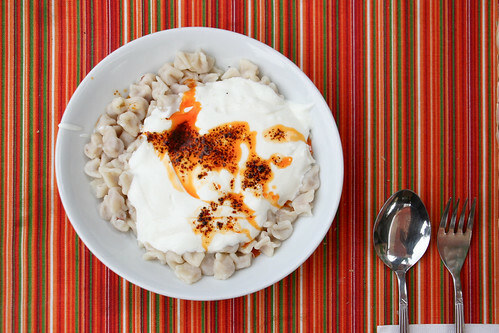 Often translated for tourists as “Turkish Ravioli,” Manti is microscopic; tiny packets are filled with a touch of ground lamb and then served in some very garlicy yogurt. The whole dish is spiced with red pepper powder and melted butter. It’s photogenic, and delicious. 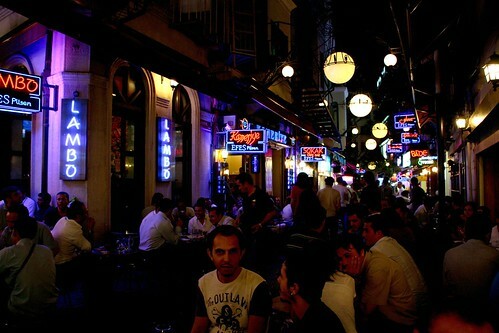 A Köftesi restaurant is another notable category where a few bucks earn you a good meal. 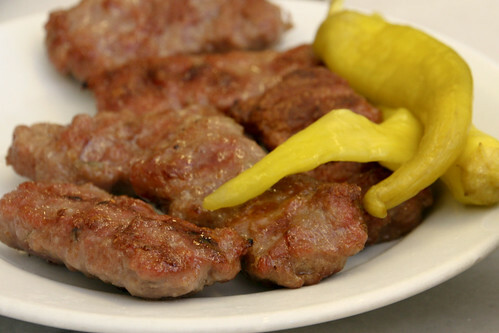 These spots serve only Köfte, spiced meatballs, coming out of the kitchen by the thousands alongside long thin green peppers and the ubiquitous shepherd’s salad (cheese, white bean, tomato, cucumber). Since the menu only consists of 3 or 4 items, it’s easy to try everything a Köftesi is offering. 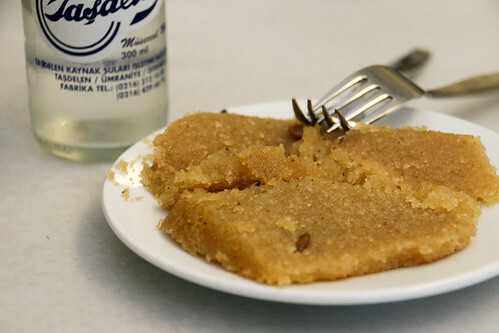 Ours had a yummy honey-soaked semolina cake for dessert. Strong black tea is consumed all day long, and offered with every meal, extended shop visits or just for the hell of it in a retail alley. 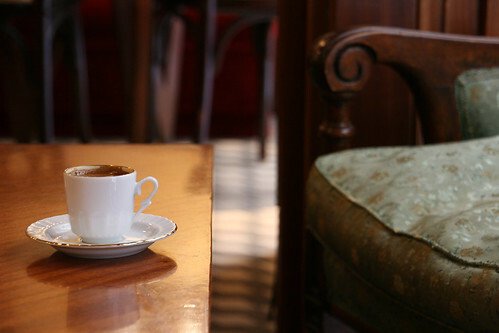 Of course Turkish coffee is a unique experience as well, but we found it more rarely offered. So, the above covers the fundamentals of Turkish cuisine, and absolutely represents what you’ll be finding most often on the street and on English-language menus. 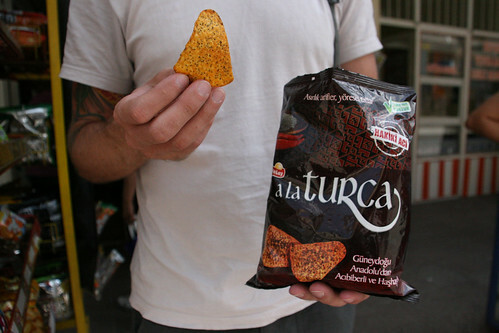 For us however, covering the broad reach of Turkish flavors became a sort of obsession, and we went out in search of something a little less common. The best plan for tackling a lot of Turkish dishes in one go is heading out to the new city on the Galata Tower side of the water. Here Meze restaurants rule the scene. 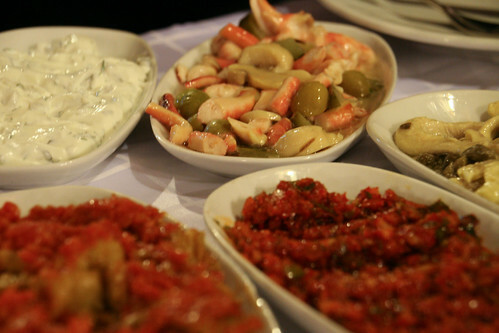 Basically small appetizers, Meze attract groups, filling their tables with tiny plates served, of course, with Raki. The more people you bring, the more Meze you try, and thanks again to Volkan, we didn’t have to go out for Meze alone. Meze feasts translate well for foreigners, as the host will bring around a gigantic tray displaying most of the Meze available that evening, and the table then points to their selections. 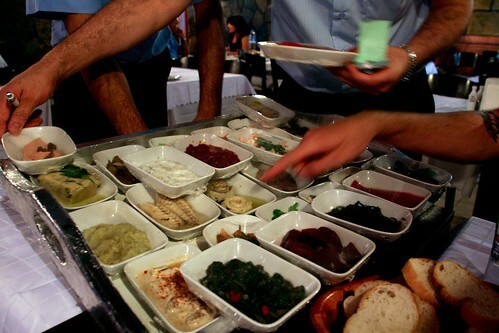 Many appetizers are vegetarian, the rest is often fish; we saw few meat Meze. Eggplant is huge — we don’t think we’ve ever seen so many eggplant dishes! Favorites from our evening out were Acılı ezme (like a spicy Turkish salsa), Baba Gannuş, Cacık (yogurt with mint and olive oil), Şakşuka (fried eggplant), and the various pickled fish (seriously mouthwatering). 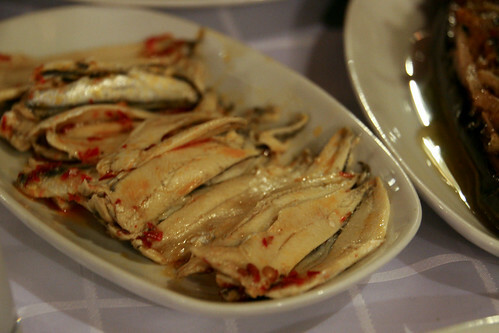 Istanbul’s geography means lots of water, and lots of seafood. 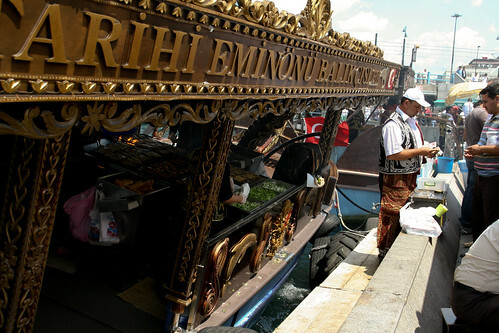 In Eminönü near the Galata Bridge, the scent of freshly grilled fish absolutely suffuses the air. 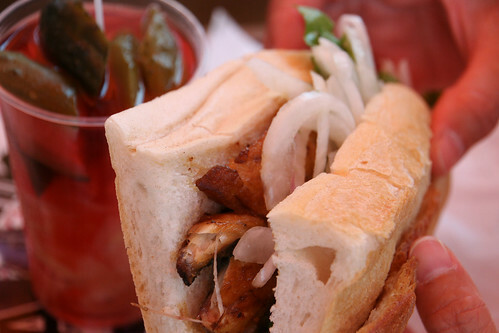 Almost everyone is chowing down on a fish sandwich made with tomatoes, herbs and onion. Docked boats vend these things, as they roll perilously on the waves, their cooks and grills seemingly glued to the deck. If you’re brave, have a glass of turnip or pickle juice on the side. For an authentically Turkish foodie quest, visit the Egyptian spice market and track down the cheese which is cured in a full, shaggy goat skin. Mmmm! Hairy cheese. After having performed well at our culinary challenges, Volkan suggested going for the gold. He and every Turk will tell you that after a night out drinking, the only sensible meal is a nice hot bowl of İşkembe soup. Time for tripe! Half the world seems convinced of the magical powers of stomach lining, as we count off Mexico’s Menudo, Spanish Callos, Eva’s native Flaki, Haggis… Tripe unites the world, apparently. The restaurant we visited specialized in İşkembe, but not only… cheek, eye, brain, tendon rounded out our multiple choices. It was good! And spicy! Don’t know if we’ll be eating the sheep’s face again, but talk about a memorable meal. Tasting the flavors of Turkey is a constant jog between known and unknown, familiar and foreign. What we would sample here would continue to appear throughout Greece and the Balkans, disguised by different names. 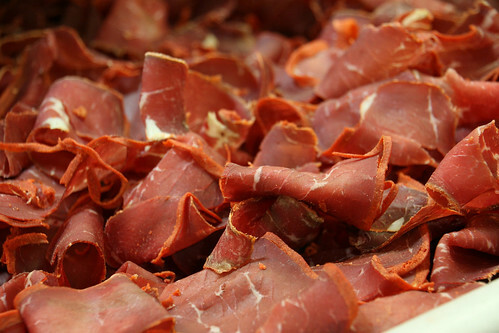 Bet you didn’t know something else you eat back home comes originally from Turkey: pastrami (shown here with it’s traditional outer shell of paprika paste). The pastry you photographed looks absolutely delicious. I have enjoyed your tales and photographs. Very curious about your experience with the hostels you have stayed in. Discussing a possible RTW trip with my husband and he is kind of skeptical about them. We had never stayed in a hostel prior to this trip so it was a learning experience for us. Now we are tempted to try to open one of our own. We are trying to put together a hostel post right now but it may take some time since the internet is not as common in India. We also don’t have as many pictures of hostels as we would like, just didn’t occur to us. Overall, hostels can be as wildly different as hotels. Our best advice is look for good security (lockers and access to the rooms or hostel), check reviews for cleanliness and the newer the hostel, the better the experience, usually. Seems that once a hostel is built, it is sometimes the last time they fix or clean anything. Some countries are better than others. For example, the UK can be really expensive and filthy at the same time. We never had any luck with any Hosteling International affiliated hostel so don’t waste your money on the card. They were usually dirty or crooked. If you find one of these places, they will make you buy the card to get a “small” discount. 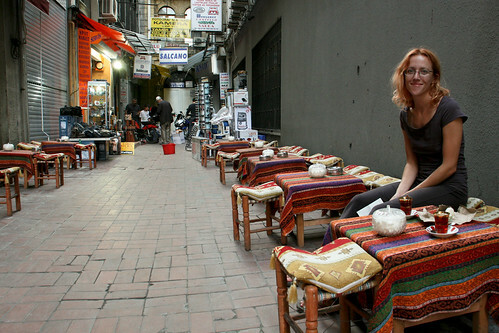 Eva used http://www.hostelbookers.com a lot. Hope that helps, we will get the post up as soon as possible. I already like Turkish food. Anything with spices usually rates high on my fave list. I haven’t tried Manti, so I think I should hunt it down here in Toronto (since we have a huge Turkish population and have recently acquired Hedu Turkoglu for our Raptors b-ball team). Oh yeah, and regarding tripe uniting the world…don’t forget those Chinese or Vietnamese noodle soups that come with these soft honeycomb jellies. 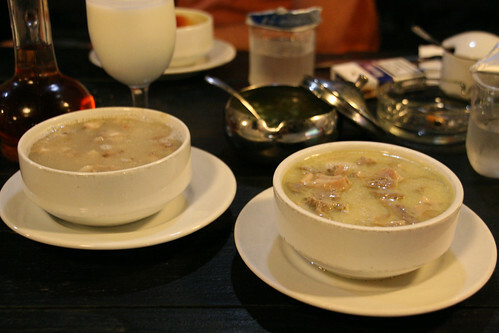 The Chinese (Taiwanese, Singaporeans) like to eat tripe in curry sauce, too! Yum yum dim sum! Just wanted to say thanks to you two and to Patrick Morrison who suggested I take a look at your blog. I just spent the last three nights in Istanbul and am writing from an overnight bus to Cappadocia. It is amazing how frequent wifi connections can be found. We acted on your suggestion for Doy Doy, and couldn’t have had a better experience. It took us some time to find it, as we didn’t master our way around Sultanahmet for a day or two, but we were tempted each time we saw their delivery scooter race by. We finally happened upon it just as the sun was setting and enjoyed what was easily the best meal of the area. Beyond their free wifi, we were much more pleased with the incredible view of the Blue Mosque as the sun illuminated it in fantastic new ways and it lit itself up further with well placed lights as darkness set in. Thanks again for keeping such great notes for the rest of us to make use of. Actually Turkish is known for really good seivcre on most of their flights. They’ve become somewhat prestigious and their business class seats on their Airbus A330s and Airbus A340s (the aircraft they use for overseas flights) are really nice, and oddly similar-looking to Air France’s business class. Some very good friends of mine flew Turkish Airlines on a regional flight from Istanbul to Belgrade last summer. They said it was fantastic, and they flew only in Economy. I’ll guess and say your flight will be an enjoyable one. Note that the airline just joined Star Alliance in April, so if you have a Star Alliance account that will be a good flight for getting some miles for possible future discounts with Star Alliance partners.